Here we are, Christmas Eve, there is snow on the ground, no creatures are stirring (kids are watching all the marathon Christmas movies and the mice I have been raging war against have been obliterated-THANK GOODNESS-) and Santa is ready. Whew....we've made it! We have been busy enjoying Christmas parties with loved ones. We started off with an evening at Jarom's folks where his mom honored her German ancestry by a traditional chicken soup with butter balls dinner. So delicious. And rivvel kucha (bread cake w/ streusal type topping) for dessert. 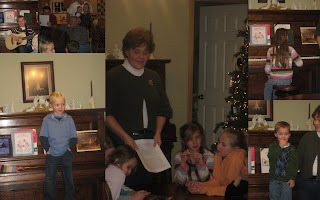 We enjoyed a talent show and sing along put on by the grand kids and learned Stille Nacht thanks to You Tube. 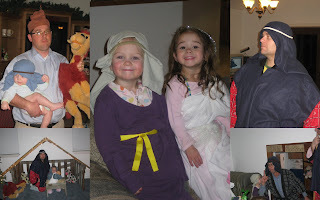 The night ended with the annual Nativity done by the grand kids. Always so adorable. We also did the annual Manwaring progressive dinner. This year it was progressive "snacking" where each house served appetizers. Justin & Amber served mini kabobs on toothpicks and fried raviolis w/ marinara sauce. Emily & Brandon served artichoke dip and bacon wrapped water chestnuts. Our house was the next stop with meatball subs to be enjoyed. Then we were off the Ben & Kaylin's where they served up his famous pot stickers. We ended the night at Kevin & Becky's where we got brownie and pudding cups for dessert. We watched the BYU football game and made gingerbread houses with 20 kids. 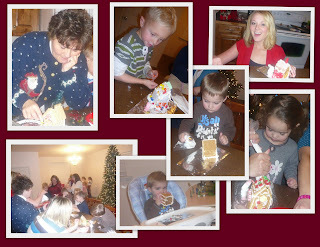 It actually didn't end disastrous and the kids have LOVED their gingerbread houses. We also celebrated with my family by eating another yummy dinner, having a family nativity, and opened gifts (It has been fun to have a few days to enjoy those gifts and then get to have round two tomorrow with more gifts.). Quin and Natalie drove up from California so we were able to spend time with them and we've been enjoying making fresh squeezed orange juice from the big box of oranges they brought up. We did have a scare when we thought my brother-in-law Bryon was stranded while hunting. We had a horrible snow and wind storm come through and it was starting to get past the time when we felt like someone should have heard something from him. We ended up calling search and rescue only to hear from Bryon a short 15 minutes later. We're just thankful he was safe. And with all the parties behind us we are now looking forward to the relaxation the next few days will bring. Hope everyone has been having and will continue to have a wonderful holiday. have a good day tomorrow! Merry Christmas!!! It's a beautiful white one here in Utah as well. I am happy to report that my war with the mice is over too and I am so relieved. WHEW!!! THat post was a HUGE undertaking. 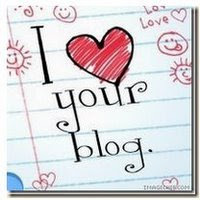 You truly deserve a bloggy medalian or something. Anyway, Merry Christmas, and I truly hope you get in some well deserved rest. Who'd "u" thunk that partying could be so exhausting! Miki- That is Quin's wife Natalie. You didn't meet them, they live in CA. And Kade's little girl Brylee is who you can see around the dog. That dog is as big as a camel....or a cow :)! Very cute! I loved having a white Christmas this year! And now I am all caught up! G'night :)!